[London]: G. Brookshaw, 1812. Aquatint engraving, with some stipple, printed in colours and finished by hand. In excellent condition. Image size: 16 1/4 x 12 1/8 inches. A fine image from Brookshaw's masterpiece: 'Pomona Britannica; or, A Collection of the Most Esteemed Fruits'. George Brookshaw's 'Pomona Britannica' is the finest work on fruit and flowers ever produced. Its breathtaking images display a level of technical virtuosity and beauty that distinguish this magnificent work as a true work of art. As a retired cabinetmaker, Brookshaw produced his seminal botanical study late in his career, at first publishing it in parts and then as a complete edition in 1812. The fact that this outstanding work took ten years to complete is evident in the quality of its images and the care with which Brookshaw executed each individual picture. 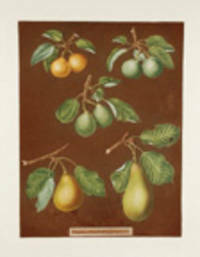 'Pomona Britannica' was produced as a visual record of the best available varieties of fruit in an attempt to encourage gardeners to experiment with growing fruit, and illustrates examples found in the Royal gardens at Hampton Court, Kensington Gardens, and the private gardens of the Prince of Wales in Blackheath. 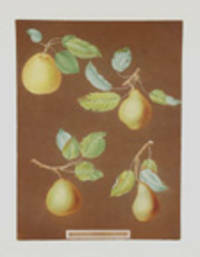 'Pomona Britannica' differs from other botanical works in its dark aquatinted backgrounds and its stylized compositions. By using aquatint to create a contrasting background, Brookshaw manages to produce a truly dramatic effect. His use of stylized composition distinguishes his pictures from the dry scientific illustrations found in other botanical studies and creates an exceptionally beautiful visual experience. 'Pomona Britannica' is not only a didactic study, it is a masterpiece of illustration in which every picture is a testament to the artist's talent and ingenuity. Cf. Dunthorne 50; cf. Great Flower Books (1990) p. 81; cf. Nissen BBI 244; cf. Sandra Raphael An Oak Spring Pomona 40a. London: Cadell and Davies, 1812. Full leather. Three volumes. Octavo. Adam Smith Wealth of Nations. 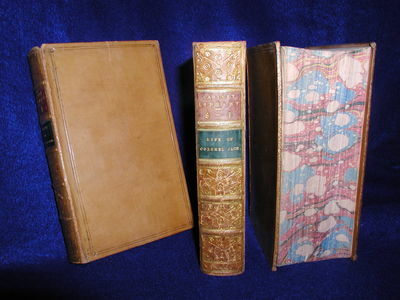 Bound in full tan calf, single ruled-line to covers,all edges gilt, raised bands, green title labels, gilt floral motif to spine, marbled endpaper. Fine. [London]: G. Brookshaw, 1812. Aquatint engraving, with some stipple, printed in colours and finished by hand. In excellent condition with the exception of some minor infill work on the bottom left corner of sheet. Image size: 16 1/8 x 12 3/16 inches. A fine image from Brookshaw's masterpiece: 'Pomona Britannica; or, A Collection of the Most Esteemed Fruits'. George Brookshaw's 'Pomona Britannica' is the finest work on fruit and flowers ever produced. Its breathtaking images display a level of technical virtuosity and beauty that distinguish this magnificent work as a true work of art. As a retired cabinetmaker, Brookshaw produced his seminal botanical study late in his career, at first publishing it in parts and then as a complete edition in 1812. The fact that this outstanding work took ten years to complete is evident in the quality of its images and the care with which Brookshaw executed each individual picture. 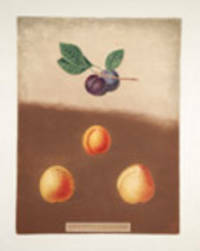 'Pomona Britannica' was produced as a visual record of the best available varieties of fruit in an attempt to encourage gardeners to experiment with growing fruit, and illustrates examples found in the Royal gardens at Hampton Court, Kensington Gardens, and the private gardens of the Prince of Wales in Blackheath. 'Pomona Britannica' differs from other botanical works in its dark aquatinted backgrounds and its stylized compositions. By using aquatint to create a contrasting background, Brookshaw manages to produce a truly dramatic effect. His use of stylized composition distinguishes his pictures from the dry scientific illustrations found in other botanical studies and creates an exceptionally beautiful visual experience. 'Pomona Britannica' is not only a didactic study, it is a masterpiece of illustration in which every picture is a testament to the artist's talent and ingenuity. Cf. Dunthorne 50; cf. Great Flower Books (1990) p. 81; cf. Nissen BBI 244; cf. Sandra Raphael An Oak Spring Pomona 40a. Friedrich von Schillers sämmtliche Werke. (12 Bände in 14 Abteilungen, in 10 gebunden). Vollständige Erstausgabe. Paris: Barba, Libraire, 1812, 1812. First edition. Freeman, Bibliotheca Fictivia, 1639. Boards darkened; some light foxing; very good copy.. 8vo, later tan boards, red leather label, gilt rules and lettering. Half-title present. A scarce study of literary forgery by French author, antiquary and bibliophile Charles Nodier (1780-1844), who was also apparently well versed in the subject: "The French C19 saw Charles Nodier, whose Questions de LittÃ©rature LÃ©gale . . . is a minor classic of forgery criticism, repeatedly poise on the borderlines of fiction and fraud - another gamekeeper turned poacher." - Freeman, page 62. Contemporary signature on the title-page of Greek scholar and publisher Jean-FranÃ§ois Boissonade (1774-1857). Voyage à Genève et dans la vallée de Chamouni en Savoie. Ayant pour objet les sciences, les arts, l'histoire, le commerce, l'industrie, les moeurs des habitans, etc. etc. LE MAÏS ou blé de Turquie, apprécié sous tous ses rapports, mémoire couronné le 25 août 1784 par l'Académie royale des Sciences, Belles Lettres & Arts de Bordeaux. Nouvelle édition revue & corrigée, imprimée par ordre du Gouvernement. Imprimerie Impériale, Paris 1812 - Paris, impr. Impériale, 1812, in 8°, de VIII-303pp pleine basane , dos lisse orné.Petits manques à la coiffe supérieure ainsi que sur le haut du plat. Quelques annotations marginales (assez peu ) Seconde édition augmentée, mais en fait première destinée à la vente. Comme Parmentier le dit lui-même dans son avertissement, il avait fait édité ce texte une première fois en 1785 mais à si petit nombre que personne n'a pu le lire. ( Oberlé 816 ). Outre la description de la plante , de sa culture , de sa conservation , on trouve de très nombreuses recettes de boissons ou de cuisine. L ' Europe doit beaucoup à Parmentier .Il a passé sa vie à mettre en valeur des produits ignorés ou méprisés.Il est à l' origine de notre alimentation ( pomme de terre , maîs, sucre de betterave , lait, vinaigre, conserves. )Il est aussi à l' origine de la création de l' Ecole de boulangerie et a participé à la création de la 1ère raffinerie de sucre de betterave . Kii no kuni meisho zue. (Berühmte Orte in der Provinz Kii). Landschaft mit der Ruine einer gotischen Kirche, davor Hirte mit Vieh. - Feder in Schwarz und Grau, braun laviert, über Bleistift, mit grauer Feder umrandet, auf Bütten, unten signiert und datiert &#132;Joh: Jacob Hoch f. 1812.". 15,4:19,4 cm. - Verso an den Rändern alte Leimspuren. Johann Jakob Hoch wurde wie sein Bruder Georg Friedrich (1751-1812) von dem Mainzer Kurfürsten Friedrich Karl von Erthal zu seiner Ausbildung ins Ausland geschickt und sie reisten gemeinsam 1778 nach Wien. 1783 ging er von Wien nach Paris, 1788 kehrte er nach Mainz zurück. Er schuf peinlich genau ausgeführte Kabinettstücke in Öl und Gouache, Zeichnungen und Miniaturen folgender Themen: Porträts, Blumenstilleben, Historien- und Genreszenen, Ansichten von Mainz und Umgebung. Leben des C. Julius Cäsar. 4 Bände. Mit 4 Titelkupfern. Collin's Peerage of England; Genealogical, Biographical and Historical. Greatly Augmented and Continued To The Present Time by Sir Egerton Brydges. K.J. [London]: G. Brookshaw, 1812. Aquatint engraving, with some stipple, printed in colours and finished by hand. In excellent condition with the exception of some repairs to extreme edge of sheet not affecting image. Image size: 16 1/8 x 12 1/8 inches. A fine image from Brookshaw's masterpiece: 'Pomona Britannica; or, A Collection of the Most Esteemed Fruits'. George Brookshaw's 'Pomona Britannica' is the finest work on fruit and flowers ever produced. Its breathtaking images display a level of technical virtuosity and beauty that distinguish this magnificent work as a true work of art. As a retired cabinetmaker, Brookshaw produced his seminal botanical study late in his career, at first publishing it in parts and then as a complete edition in 1812. The fact that this outstanding work took ten years to complete is evident in the quality of its images and the care with which Brookshaw executed each individual picture. 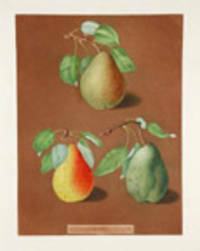 'Pomona Britannica' was produced as a visual record of the best available varieties of fruit in an attempt to encourage gardeners to experiment with growing fruit, and illustrates examples found in the Royal gardens at Hampton Court, Kensington Gardens, and the private gardens of the Prince of Wales in Blackheath. 'Pomona Britannica' differs from other botanical works in its dark aquatinted backgrounds and its stylized compositions. By using aquatint to create a contrasting background, Brookshaw manages to produce a truly dramatic effect. His use of stylized composition distinguishes his pictures from the dry scientific illustrations found in other botanical studies and creates an exceptionally beautiful visual experience. 'Pomona Britannica' is not only a didactic study, it is a masterpiece of illustration in which every picture is a testament to the artist's talent and ingenuity. Cf. Dunthorne 50; cf. Great Flower Books (1990) p. 81; cf. Nissen BBI 244; cf. Sandra Raphael An Oak Spring Pomona 40a. 1812. The Bear, The Bull Dog and The MonkeyHEATH, William, (after). The Bear the Bull Dog and the Monkey. Pen and ink with watercolor on wove paper, (16 3/8 x 11 1/2 inches; 415 x 291 mm.). 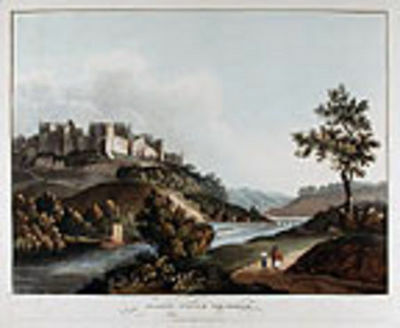 Original artwork after the published etching from August of 1812. 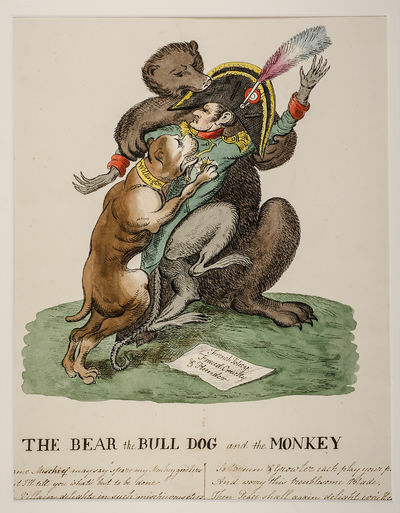 The first image of the Russian campaign which commenced in late June, Napoleon as half-ape, gripped by the Russian bear and savaged by the bulldog, named on its collar as Wellington, manuscript verse below. "Dame Mischief may say "spare my Monkey good SirsBut I'll tell you what's best to be doneThe Villain delights in such mischievous stirsThat 'tis wisest to stop all his funSo Bruin & Growler each play your partAnd worry this troublesome Blade,Then Peace shall again delight evr'y HeartAnd the Rogue will be robbed of his Trade"[c.f. BM Satires 11896], c.1812. [London]: G. Brookshaw, 1812. Aquatint engraving, with some stipple, printed in colours and finished by hand. In excellent condition apart from light soiling in the margin. Image size: 16 1/8 x 12 1/4 inches. A fine image from Brookshaw's masterpiece: 'Pomona Britannica; or, A Collection of the Most Esteemed Fruits'. George Brookshaw's 'Pomona Britannica' is the finest work on fruit and flowers ever produced. Its breathtaking images display a level of technical virtuosity and beauty that distinguish this magnificent work as a true work of art. As a retired cabinetmaker, Brookshaw produced his seminal botanical study late in his career, at first publishing it in parts and then as a complete edition in 1812. The fact that this outstanding work took ten years to complete is evident in the quality of its images and the care with which Brookshaw executed each individual picture. 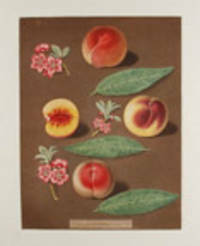 'Pomona Britannica' was produced as a visual record of the best available varieties of fruit in an attempt to encourage gardeners to experiment with growing fruit, and illustrates examples found in the Royal gardens at Hampton Court, Kensington Gardens, and the private gardens of the Prince of Wales in Blackheath. 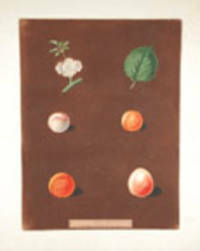 'Pomona Britannica' differs from other botanical works in its dark aquatinted backgrounds and its stylized compositions. By using aquatint to create a contrasting background, Brookshaw manages to produce a truly dramatic effect. His use of stylized composition distinguishes his pictures from the dry scientific illustrations found in other botanical studies and creates an exceptionally beautiful visual experience. 'Pomona Britannica' is not only a didactic study, it is a masterpiece of illustration in which every picture is a testament to the artist's talent and ingenuity. Cf. Dunthorne 50; cf. Great Flower Books (1990) p. 81; cf. Nissen BBI 244; cf. Sandra Raphael An Oak Spring Pomona 40a. Edinburgh: Printed for Archibald Constable and Company; T. Payne; Longman, Hurst, Rees, Orme & Brown; Cadell & Davies, [et al], London. 1812. Second edition. 4to. (iv), xvi, 481, (1) pp. Contemporary binding of full sprinkled calf by J. Carss & Co. of Glasgow with their ticket to the front pastedown, spine with raised bands, gilt lettered red label, remains of a partially removed bookplate adjacent. One folding view, 5 full page views, 2 full page maps and 1 folding map are black and white plus 8 full page colour plates, further illustrations in the text and 4 folding tables. Some foxing, neat repairs to the joints and head, an attractive copy. 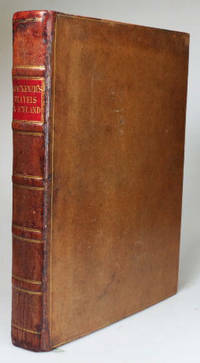 Published six months after the first edition and enlarged to include an account of the insurrection of 1809 plus a map illustrating the volcanic eruption of 1783. Reports of the Late John Smeaton made on various occasions, in the course of his employment a a Civil Engineer. Vols 1-3 (of 4 only). Edinburgh; London: James Ballantyne & Co, for John Ballantyne & Co.; Brown & Crombie; Longman, Hurst, Rees, Orme & Brown, 1812. Book. Very Good. Full-Leather. 16mo - over 5Â¾ - 6Â¾" tall. 9 Volume set. Publication dates are 1809, 1810 and 1812. Full tan leather with red & green on spine, gilt lettering and decorations on spine, gilt decorations on base, fore and top leather edges. All page edges marbled. 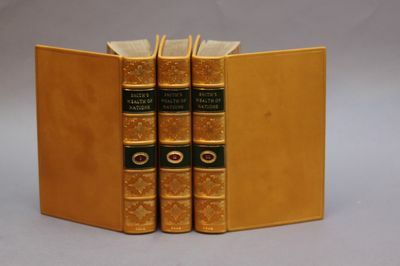 3 volumes have a less than one and 1/2 inch split at spine and front cover; volume one has a 1/4" loss of leather at top rear of spine; leather on spines is lightly crackled, and the red on spine is mostly sunned towards brown. Minor loss of leather at spine edges and some corners, corners square. Some volumes fan out slightly from spine to fore edge. Vol 1 has a few lightly bent pages at base, leaving a slight gap. Foxing on blank end papers; interior pages are clean. Pencil notes of previous sellers on end papers of first volume; ink initials on one title page. pencil note on another. Set includes the novels of Daniel Defoe: Robinson Crusoe, Memoirs of a Cavalier, The Life of Colonel Jack, The Adventures of Captain Singleton, New Voyage Round the World, History of the Plague in London in 1665. 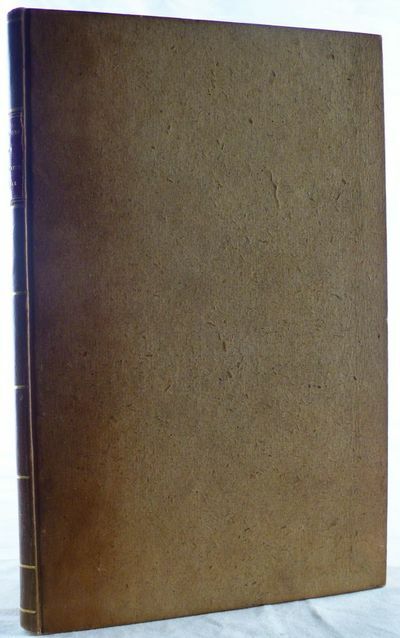 Also Mason's Treatise on Self-Knowledge, Narrative of the Honourable John Byron, and poetry by Beattie, Falconer, Somervile and Thomson with short poems by many additional authors..
London: for Cadell and Davies [and 25 others],, 1812. The twelfth edition. In which is included the posthumous volume, containing the history of Virginia, to the year 1668; and of New England, to the year 1652. 4 volumes, octavo. Contemporary russia, raised bands to spines forming small compartments gilt-tooled with star devices, alternating with larger compartments, either gilt-lettered direct or gilt-tooled with elaborate floral sprays, broad stylised palmette roll gilt to covers enclosing a central blind-stamped lattice with quatrefoils, marbled edges, foliate roll to turn-ins gilt, drab endpapers, bound blue silk page-marker to each volume. 3 folding maps, folding plate of Mexican hieroglyphics. Collector's bookplate of Robert J. Hayhurst to front pastedown of vol. 1. Joints and tips lightly rubbed, vol. 2 with superficial cracking to front joint, small abrasion to rear cover and pale marking along top edge of endpapers, small scuff to fore edge of front board vol. 3, hieroglyphics plate in vol. 4 with shallow chip to fore edge and short closed tear along fold. A very good set. 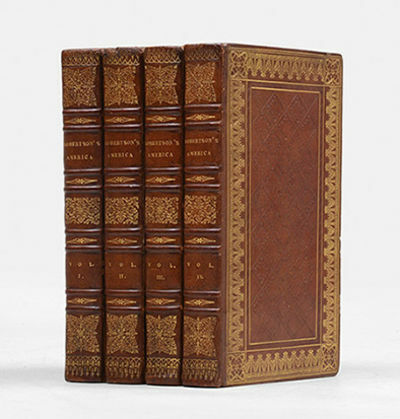 First published in 1777, Robertson's History was "the most highly regarded secondary source of its time" (Howgego); this set in a handsome, strictly contemporary Regency binding. The author had already established his reputation as "the leading historian in Europe" (ODNB) with his History of Scotland and life of Charles V when he began researching a history of the colonisation of the New World. The outbreak of hostilities in North America prompted him to publish the portion covering the sixteenth-century Spanish conquista. On publication it was very positively received, and "its success was even more marked on the continent, where it was considered Robertson's masterpiece Â… and went through nine editions between 1777 and 1780. The book Â… alternated chapters of narrative concerning the Spanish conquest with chapters of description of Native American culture and society. With its dramatic sweep of narrative, combined with a provocative confrontation of two very different stages of civilisation and a prose that was more flexible and evocative than that of his earlier books, the History of America is often regarded as Robertson's most interesting, original, and even Romantic work" (idem). The supplement, on the early history of British America, first appeared in the seventh edition, published in 1796. Montpelier: Wright and Sibley, 1812. 96pp. 16mo. Contemporary half calf and boards. Moderate to heavy wear to extremities, slight edge wear. Faint worming in end matter. One leaf with lower outer corner torn away, affecting text. Contemporary ownership signature on front and rear free endpapers. Overall very good. In a half morocco box. First Vermont printing of this entertaining, albeit apocryphal, story of Indian captivity and travel in the Northwest, after its first appearance in Boston in 1788. Though the structure of the narrative changed throughout its many editions, the tale remained the same. The author, a Dutchman, departed Amsterdam for China in 1783 and proceeded from there aboard a trading vessel to the northwest coast of America to participate in the fur trade. After a surprise attack by local Indians, Van Delure and his companion were hauled six hundred miles overland to a large city built on an island. Rescued from certain death by the local sachem, Van Delure married the Indian chief's daughter and lived among them for two years. In 1787 he encountered three white men who had supposedly travelled up the Mississippi from New Orleans. One of the men was Alonso Decalves, to whom this narrative is sometimes attributed. His meeting with the three men rekindled a certain homesickness, prompting him to extol the virtues of the Christian way of life to his native bride. 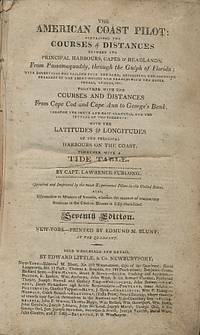 The narrative ends with the textbook conversion of his wife and her father, followed by an account of his voyage home. 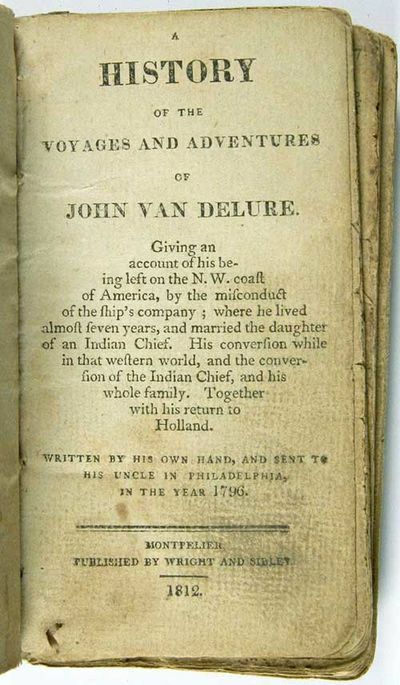 "The fictitious account which includes the narrative of the Indian captivity of John Vandelure, Vandeleur, Vandeluer, or Van Delure, passed through many editions under varying titles. In most cases these bear the pseudonym of Alonso Decalves...In others, Vandeleur, himself, is given as the author. The narrative is also included in the 'Narrative of a Voyage...from Amsterdam to China and from there to...North America,' which purports to have been written by James Van Leason or Vanleason" - Sabin. The present edition is among the rarest of this oft- reprinted narrative. OCLC locates only four copies. McCORISON 1394. SHAW & SHOEMAKER 27374. SABIN 98466. AYER, INDIAN CAPTIVITIES 130. STREETER SALE 4232. VAIL 1188. HOWES V24, "b." FIELD 1593. OCLC 10248784. [London]: G. Brookshaw, 1812. Aquatint engraving, with some stipple, printed in colours and finished by hand. In excellent condition with the exception of some minor infill work on the bottom right corner of sheet. Image size: 16 1/8 x 12 1/2 inches. A fine image from Brookshaw's masterpiece: 'Pomona Britannica; or, A Collection of the Most Esteemed Fruits'. George Brookshaw's 'Pomona Britannica' is the finest work on fruit and flowers ever produced. Its breathtaking images display a level of technical virtuosity and beauty that distinguish this magnificent work as a true work of art. As a retired cabinetmaker, Brookshaw produced his seminal botanical study late in his career, at first publishing it in parts and then as a complete edition in 1812. The fact that this outstanding work took ten years to complete is evident in the quality of its images and the care with which Brookshaw executed each individual picture. 'Pomona Britannica' was produced as a visual record of the best available varieties of fruit in an attempt to encourage gardeners to experiment with growing fruit, and illustrates examples found in the Royal gardens at Hampton Court, Kensington Gardens, and the private gardens of the Prince of Wales in Blackheath. 'Pomona Britannica' differs from other botanical works in its dark aquatinted backgrounds and its stylized compositions. By using aquatint to create a contrasting background, Brookshaw manages to produce a truly dramatic effect. His use of stylized composition distinguishes his pictures from the dry scientific illustrations found in other botanical studies and creates an exceptionally beautiful visual experience. 'Pomona Britannica' is not only a didactic study, it is a masterpiece of illustration in which every picture is a testament to the artist's talent and ingenuity. Cf. Dunthorne 50; cf. Great Flower Books (1990) p. 81; cf. Nissen BBI 244; cf. Sandra Raphael An Oak Spring Pomona 40a. London: Published by J. Deeley, No. 95 Berwick Street, 1812. Coloured aquatint. Printed on wove paper. In excellent condition with the exception of some light sunning where a mat was in place. Plate mark is faint. Image size: 14 3/4 x 19 5/8 inches. A commanding view of Ludlow Castle in Shropshire. After the Norman invasion, a string of castles was planned along the English/Welsh border to guard against the unconquered Welsh, and Ludlow held one of the strongest defensive positions. The castle was built by Walter de Lacy in the late 11th century, and his family retained the lordship until the end of the 13th century. It then passed through various hands until it was taken over by the Mortimer family. In 1425 it was passed to Richard Plantagenet, the leader of the Yorkists in the Wars of the Roses, but it was taken and sacked by the Lancastrians in 1459. In 1461 when Richard's son became Edward IV, the castle became Crown property and remained so for 350 years. Edward and Richard, the two princes in the Tower, spent most of their childhood at Ludlow and Edward was there when he heard of his father's death and his accession to the throne as Edward V. They went to London for his coronation but were imprisoned in the Tower and shortly afterwards murdered. Henry VII's eldest son, Prince Arthur and his wife, Catherine of Aragon, were staying at Ludlow when he died in 1502 and his heart is buried there. His death led his younger brother to become Henry VIII on their father's death and to marry Arthur's widow who became the first of Henry's six wives. The buildings fell into disrepair during the 18th century but were restored by the Earl of Powis in 1771. [London]: G. Brookshaw, 1812. Aquatint engraving, with some stipple, printed in colours and finished by hand. In excellent condition. Image size: 16 x 12 1/4 inches. A fine image from Brookshaw's masterpiece: 'Pomona Britannica; or, A Collection of the Most Esteemed Fruits'. George Brookshaw's 'Pomona Britannica' is the finest work on fruit and flowers ever produced. Its breathtaking images display a level of technical virtuosity and beauty that distinguish this magnificent work as a true work of art. As a retired cabinetmaker, Brookshaw produced his seminal botanical study late in his career, at first publishing it in parts and then as a complete edition in 1812. The fact that this outstanding work took ten years to complete is evident in the quality of its images and the care with which Brookshaw executed each individual picture. 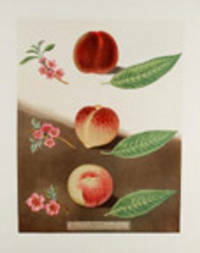 'Pomona Britannica' was produced as a visual record of the best available varieties of fruit in an attempt to encourage gardeners to experiment with growing fruit, and illustrates examples found in the Royal gardens at Hampton Court, Kensington Gardens, and the private gardens of the Prince of Wales in Blackheath. 'Pomona Britannica' differs from other botanical works in its dark aquatinted backgrounds and its stylized compositions. By using aquatint to create a contrasting background, Brookshaw manages to produce a truly dramatic effect. His use of stylized composition distinguishes his pictures from the dry scientific illustrations found in other botanical studies and creates an exceptionally beautiful visual experience. 'Pomona Britannica' is not only a didactic study, it is a masterpiece of illustration in which every picture is a testament to the artist's talent and ingenuity. Cf. Dunthorne 50; cf. Great Flower Books (1990) p. 81; cf. Nissen BBI 244; cf. Sandra Raphael An Oak Spring Pomona 40a. IDYLLISCHE WINTERTekening in waterverf toegeschreven aan Reinier Craeyvanger (1812-1880). Afm. 36,4 x 52,6 cm.De Lage Landen kenden vele vinnig koude winters. Kou die "deur vel en vleesch passeerde'. Binnenwateren en rivieren konden potdicht gevroren zijn en tot maart met een dikke ijskorst bedekt. Havens zaten dicht. De Zuiderzee werd met sledes en wagens overgestoken. Soms zwierven wolven rond op zoek naar prooi. De prijzen voor etenswaren stegen tijdens de winterperiode tot onwaarschijnlijke hoogte. Er was gebrek aan turf, hout en kolen en vooral aan vers water. Werk was moeilijk te vinden. Er stierven heel wat mensen van de kou. Ellende overheerste.Toch ligt de winter ligt veel Nederlanders na aan het hart. De gedachte aan ijs en schaatsen alleen al doet het sneller slaan. Vroeger even goed als tegenwoordig.Van de ruige realiteit tijdens grillige winters is op ijsgezichten doorgaans weinig te zien. Het koperspubliek wilde geen ellende en ook geen al te realistische weergave van borrelende scheuren, windwakken en viezigheid op het ijs. Men vroeg om een idyllisch plaatje.Prijs: â‚¬ 2.350,- (incl. lijst). Newburyport, MA: Edmund M. Blunt. Fair. 1812. Seventh Edition. Leather Bound. One of 15 editions we are offering. Go to our webpage: bookshelfmaine.com and search by KEYWORD: Blunt. You are invited to Make An Offer on any or all listed. ; 311 pages . Bildergeographie. Eine Darstellung aller Länder und Völker der Erde. Zweyter Band. Afrika. Leipzig, bey Gerhard Fleischer dem Jüngeren, 1812. - Halbledereinband der Zeit mit goldgeprägtem Rückentitel, 8°, VIII, 332 Seiten, mit 20 (davon 13 kolorierte) Kupfertafeln und einer gefalteten, kolorierten Karte. Gutes Exemplar. Temple of Flora, or Garden of the Botanist poet, Painter and Philosopher. STAMPA CARTE DES EUROPÄISCH UND EINES THEILS DES ASIATISCH - RÚSSISCHEN REICHS... / CARTE DE LA PARTIE EUROPÈENE ET ASIATIQUE DE L'EMPIRE DE RUSSIE. AVEC L'INDICATION DES CHEMINS ET ROUTES DES POSTES, AINSI QUE DES NOUVELLES DEMARCATIONS, ET DE LA RÈPARTITION ACTUELLE EN GOUVERNEMENTS. REDIGÈE D'APRES LE GRAND ATLAS ET D'AUTRES CARTES DU DÈPOT GÈPGRAPHIQUE IMPERIAL DE S.T PETERSBURG. VIENNE, TRANQUILLO MOLLO, 1812Astuccio in cartone coevo ricoperto di carta marmorizzata ai piatti e di carta rossa a un dorso; al piatto anteriore, etchetta con titolo manoscritto all'epoca, all'interno di cornice floreale: Carta della Russia di Danielow n. 25. All'interno, un cartoncino pieghevole con patta di chiusura foderato in carta marmorizzata policroma, a contenere una grande carta geografica suddivisa in 13 fogli, telati all'epoca e ripiegati, ognuno con 4 stacchi (tranne una carta con 2 e una con 6) per consentirne la piegatura; inoltre, 1 foglio anch'esso telato e di piccole dimensioni (cm 21x18) a rappresentare il quadro d'insieme della grande carta. Al primo foglio, in alto a sinistra, grande spazio per titolo in doppia lingua: tedesco e francese con, al di sotto, dati di lettura e scale metriche; al secondo foglio dall'alto, a destra, porzione di carta di cm 36x12 fuori riquadro, così come in basso al centro, foglio di cm 19x42, anch'esso fuori riquadro. In totale la carta misura cm 145x128 ca. più i due fogli fuori riquadro. Grandiosa carta geografica della Russia occidentale, redatta in occasione dell campagna napoleonica; da ovest a est, raffigura i territori compresi tra Danzica e Toblosck; da nord a sud, quelli da Kielvig a Erzelum. Esemplare in eccellenti condizioni, qualche carta con lievissima ossidazione, modesti segni di usura al cartoncino di contenimento ripiegato. London: For R. Ackerman, 1812. 2 volumes. First edition and first issue, originally issued in 16 monthly parts. 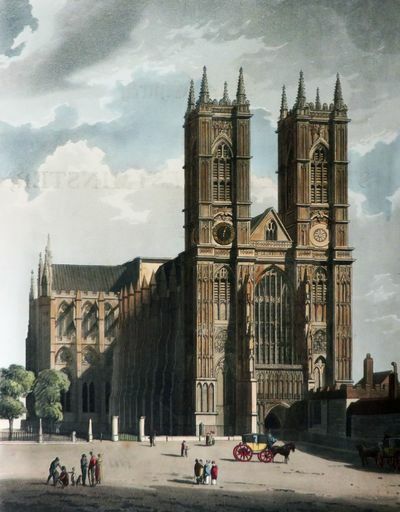 Illustrated with 81 magnificent hand-coloured aquatint plates of views of Westminster Abbey and with a portrait of William Vincent and with a floor plan. Large 4to, in truly impressive and especially beautiful contemporary bindings by Hering of full red straight-grained morocco, the spines with wide gilt decorated raised bands creating elaborately gilt tooled compartments, two compartments with black morocco labels gilt lettered and ruled, the boards with a grand gilt tool floral framework around large cathedral-window gilt centerpieces, broad handsome gilt dentelles, board edges and turn-ins, green moire silk endpapers with gilt borders and corner-pieces, a.e.g., armorial bookplate of Colonel Sir Proby Cautley on the front pastedowns. xviii, 330, ; 275,  pp. A very rich and splendid set, the plates very clean and bright in brilliantly designed, strong and firm bindings, some inevitable offsetting from plates to text, the text leaves with some very occasion light spotting. FIRST EDITION OF THIS TRULY GRAND WORK BRILLIANTLY BOUND AND A WONDERFUL SET WITH 81 HAND-COLOURED SCENES OF WESTMINSTER ABBEY, ONE OF THE GREAT ACKERMANN PLATE BOOKS. The fine subtly hued images include both interior and exterior views of the Abbey. They include not only the architectural features but also the stained glass windows, mosaic pavement, the chapels, monuments, effigies and transepts. The artist included F. Mackenzie, A. Pugin, J. Bluck, T. Uwins, G. Shepherd, J. Hamble, T. Sutherland and others. The set is the very scarce first issue of the edition, with the first plate of volume two, "Aymer de Valance", marked "F. Mackenzie delt." as called for. The half-titles and subscriber's list are retained within the truly striking Hering red morocco bindings. This is one of Ackermann's major colour plate books. [London]: G. Brookshaw, 1812. Aquatint engraving, with some stipple, printed in colours and finished by hand. In excellent condition with the exception of some repairs to extreme edge of sheet not affecting image. Image size: 16 1/8 x 12 1/4 inches. A fine image from Brookshaw's masterpiece: 'Pomona Britannica; or, A Collection of the Most Esteemed Fruits'. George Brookshaw's 'Pomona Britannica' is the finest work on fruit and flowers ever produced. Its breathtaking images display a level of technical virtuosity and beauty that distinguish this magnificent work as a true work of art. As a retired cabinetmaker, Brookshaw produced his seminal botanical study late in his career, at first publishing it in parts and then as a complete edition in 1812. The fact that this outstanding work took ten years to complete is evident in the quality of its images and the care with which Brookshaw executed each individual picture. 'Pomona Britannica' was produced as a visual record of the best available varieties of fruit in an attempt to encourage gardeners to experiment with growing fruit, and illustrates examples found in the Royal gardens at Hampton Court, Kensington Gardens, and the private gardens of the Prince of Wales in Blackheath. 'Pomona Britannica' differs from other botanical works in its dark aquatinted backgrounds and its stylized compositions. By using aquatint to create a contrasting background, Brookshaw manages to produce a truly dramatic effect. His use of stylized composition distinguishes his pictures from the dry scientific illustrations found in other botanical studies and creates an exceptionally beautiful visual experience. 'Pomona Britannica' is not only a didactic study, it is a masterpiece of illustration in which every picture is a testament to the artist's talent and ingenuity. Cf. Dunthorne 50; cf. Great Flower Books (1990) p. 81; cf. Nissen BBI 244; cf. Sandra Raphael An Oak Spring Pomona 40a. Walpole, N.H.: Printed for Elijah Brooks, 1812. 24mo, iv, -71 pages. The eighth edition of Amelia Simmons' American Cookery, originally issued Hartford, 1796. The first American cookbook authored by an American and printed and published in the states. American ingredients such as corn meal and squash are printed here for the first time, including "Indian Slapjack," "Johny Cake," and "Squash Pudding." 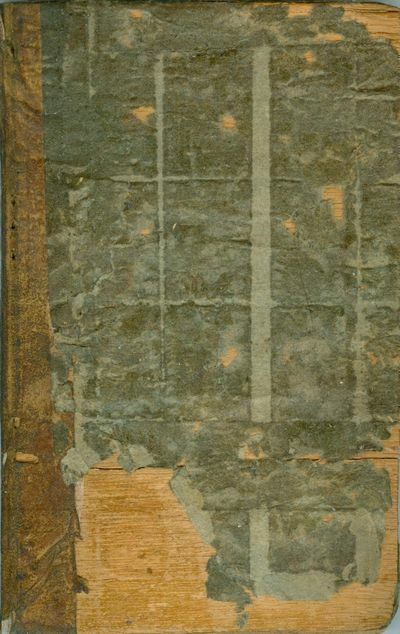 In a scale-board binding, contemporary one-quarter brown calf, with gray-green paper over boards. Calf shows some small holes, and a cord has been sewn through the head of the spine for hanging. The paper covered boards show some adhesion marks from masking tape has been removed by a professional restoration binder, and some of the scale board is showing through where there is loss to the paper. The boards still exhibit some tackiness from the removed tape. The original endpapers and hinges have been preserved and strengthened. Small later ownership sticker to the free front fly. All early editions are rare. [OCLC locates eleven copies of this printing; Bitting, page 435; Lowenstein (3rd) 60]. Ländliche Szene mit Rindern und Ziegen auf der Weide vor einem Bauernhaus. Lavierte Bisterzeichnung auf Büttenpapier. München, rechts unten signiert und datiert, 1812 - 18 x 30 cm. *Peter Hess wurde in Düsseldorf geboren, als Sohn des Kupferstechers Carl Ernst Christoph Hess lernte er schon früh die Kunst der Zeichnung und begann bereits mit 14 Jahren seine Ausbildung auf der Münchner Kunstakademie. Er "gehört zu jenen bahnbrechenden Künstlern, welche seinerzeit die moderne Münchener Schule begründeten, ja er ist unzweifelhaft der erste bedeutende Realist derselben . Vorgänger hatte er dabei an W. v. Kobell, Alb. Adam und dem Thiermaler und Radirer Klein, die er indeß bald alle übertraf" (ADB 12, S. 300 ff.). In den Jahren 1813-14 begleitete er den Fürsten Carl Philipp von Wrede als Maler auf den Befreiungskriegen, in der Folge wurde Hess zu einem der besten deutschen Schlachtenmaler des frühen 19. Jahrhunderts. Vorliegend eine sehr frühe Arbeit von Hess, noch am Ende seiner Ausbildung. Sprache: Deutsch Gewicht in Gramm: 800 An den Ecken alt auf Untersatzkarton montiert, am rechten Rand mit kleiner hinterlegter Fehlstelle.